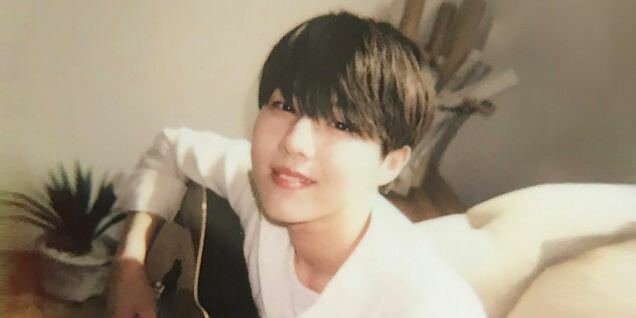 Singer-songwriter Yoo Seung Woo has just released his 4th mini-album: 'Romance.' The album is self-composed, but he also brings in Lovey and her oppa Brother Su to add their unique charms to the mix. The EP starts out with "Romance," which is a quiet, unassuming love song. His only accompaniment is an acoustic guitar, but 2 minutes in the song acquires some heft with the electric guitars and orchestra. He starts out tender, but his voice becomes emotionally fraught as the song progresses. "Anymore" is the title track, and it is sung mostly against the�piano. I like how the tune progresses, Seung Woo carries you through the tune with his beautiful voice. "500 Days of Summer" is an upbeat tune, the first such we've heard thus far. It's got a nice beat, and you can almost hear the singer smiling. "Want You" is even more upbeat, and even higher-tempo. It's refreshing to hear these kinds of tunes, as I was starting to drown in sentimentality. "I Love You" only becomes a duet in its last part, otherwise the singers just do their own parts. Lovey has a pretty voice, and it blends sweetly with Seung Woo's. The song slows thing down, but only slightly.� "Tonight" is mostly stripped down, with only nods to flourishes in the last part, and only slightly at that. It's very sentimental, very soothing, and I could easily imagine going to sleep to this one. As balladeers go, he's not bad. In some ways he reminds me of Kyuhyun, only Seung Woo sings in a lower register. While the subject matter isn't amazing -- all the songs are about love, as 98.9% of pop songs are, you get the sense he's been there�and is able to wrestle powerful emotions from his vocals. If you want to know the highs and lows of love from a gifted artist, pick this one up. Seung Woo goes about his day listlessly. He stares at the clock-- alone. He eats soggy cereal for breakfast -- alone. He sits at a table and stares -- alone. Getting the picture yet? Seung Woo's breakup has sucked all the life out of him. Everything he does, from reading to just sitting, reminds him of her -- or at least causes him pain. He even comes close to crying a few times. There's no happy ending here, only the promise of more painful memories. And that's more than a bit heartwrenching. Led into this world by his voice, you can't help but feel for the guy. You may even mist up a bit. If his vocals weren't top notch, this would be a pretty boring trip. There's no beautiful girl to show what he's missing. There are no happy times interspersed here and all the colors are muted. It's a pretty convincing 4-minute vignette. The MV makers really do their job, giving you a glimpse inside of heartbreak. It's not the best of these I've seen, but it's certainly not the worst.